Carbon panels are normally supplied and fitted with an aluminium frame and can be made to any reasonable size to match existing panels of all makes. The depth of panel is restricted by our own imposed limits of not less than 10mm and not greater than 60mm Actual depth. Capacities shown for Panels & ‘Discarb’ units are based on a dwell time of 0.1 seconds, which is the normally accepted minimum for most applications. For ‘heavier’ odours i.e. Indian cooking odours, a contact time of 0.3 seconds is recommended, which will effectively reduce the Face Velocity and rating to one third..
Where hot air is being filtered (e.g. extract from cooker hoods) the carbon cells should be positioned as far from the heat source as possible. Air stream temperatures must be maintained below 40Deg C. and humidity levels below 80% RH. If temperatures or humidity in excess of either of these figure are anticipated, the airstream must be treated to ensure compliance. Additional fresh air, and or cooling may be considered as suitable measures. 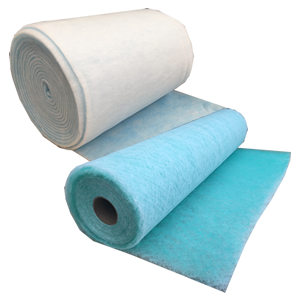 Pre-filters should be fitted in the ventilation system to protect the carbon filters in all installations from particulate contamination. We do not consider a glass panel to be suitable and recommend a filter having a minimum grade of F5 to EN779. Some cooking operations give off large amounts of smoke, which is extremely detrimental if allowed to reach the carbon filters( smoke is a particulate). In most cases this can be overcome by the use of a good quality pre-filter. e.g. an F8 Grade Bag Filter or better, depending upon circumstances. 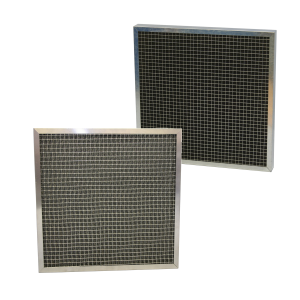 In some instances a HEPA Filter grade H14 is necessary. 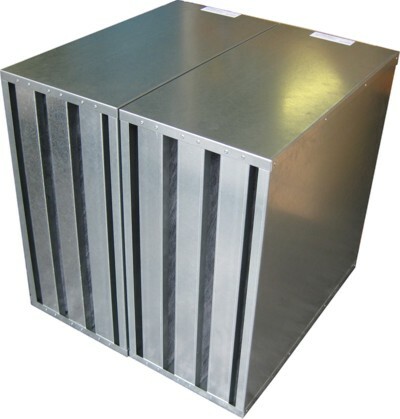 ’Discarb’ Cells can be ‘tailor-made’ to any reasonable size to fit ducting, air-handling units etc. It is extremely difficult to calculate in advance the life expectancy of an activated carbon filter. Generally speaking, accurate information regarding concentration and details of all contaminants in the airstream are not available and in any case these are often constantly changing. However, reasonably accurate life expectancy levels can be obtained by a method known as CTC testing. Either a small sample of carbon from one of the cells, or a complete panel, should be returned to us together with the date of installation. From this information the contamination level will be assessed in the laboratory, which will indicate the likely remaining useful life of the carbon. This testing service is totally free of charge to our customers.